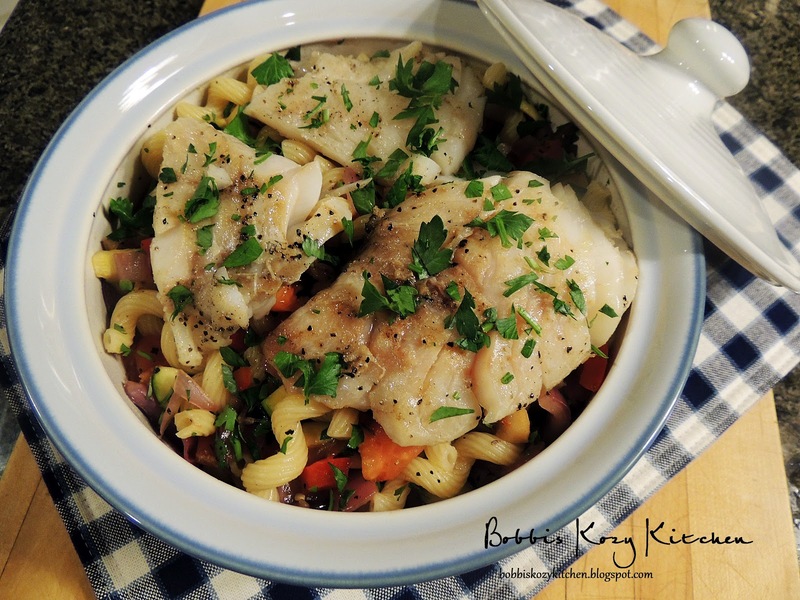 One of the families past favorites is Cod Ratatouille en Papillote. I was so happy to find a way that we all liked veggies we just don’t normally eat. Eggplant? Zucchini? Not everyday food for us in this house. I have been lucky enough to sneek them in a few dishes that everybody liked but this was a BAM in your face you are eating eggplant right now! So like I said, pleasantly shocked errr surprised that everyone fell in love with the dish. Now it is summertime and I am going through a grilling obsession. It is bad, really bad, I want to gill everything!! It has gotten to the point that my dogs go to the other side of the yard when I am standing by the grill. They just aren’t going to take any chances! But my mind was not on how to grill my dogs eewwwww *shudder* but rather on this cod dish we had loved so much. How could I make that dish on the grill? I contemplated using tin foil but I decided against that since it really isn’t grilling so much as steaming something on the grill. I had just read a blog post from a friend of mine, Melissa at Chin Deep and she had just done Baba Ganoush using grilled eggplant. Yessssssss I will grill all of the veggies that were in the dish, grill the fish, and then put it all together. We have a plan working now!! I could just taste all of those wonderful flavors. Oops gotta run to the store! So I picked up a few more things to grill through the week. One of them being Melissa’s Baba Ganoush, and got home in record time! As I sit down to flip through my new Everyday Food magazine what do I see? 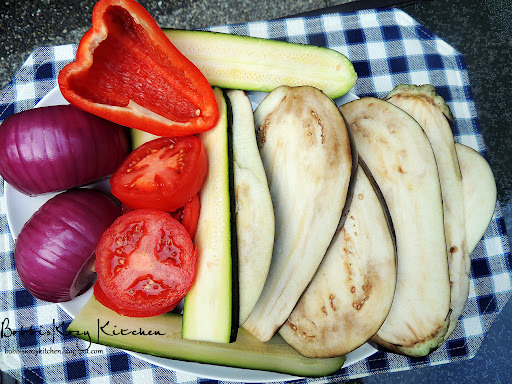 Grilled Ratatouille Pasta! Wow here I thought I was being so original *sigh* oh well. But I did like the addition of the pasta to the game and they didn’t have fish with theirs so it is kind of a marriage of the two recipes now. I don’t really care, all I know is that it tasted very very good. There were 5 people eating and this dish got a thumbs up from all of them. How could I be any happier? How pretty do these babies look? Is it bad when you get all giddy over fresh produce? Hhmmm maybe I need to get out of the kitchen more often. 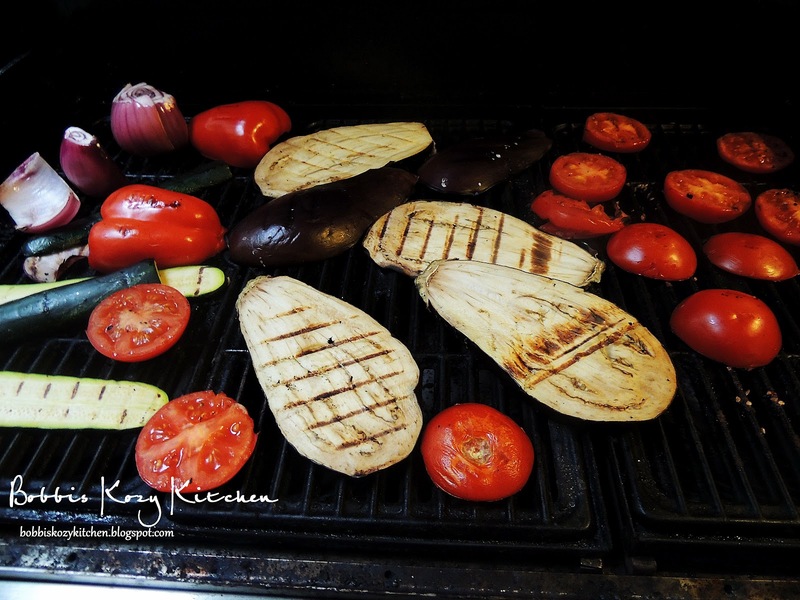 With the grill on medium-high heat, and lightly greased, we tossed all the veggies on the grill. It takes our grill about 5 minutes or so per side but your grill times may vary so start checking after about 3 minutes or so. See how yummy they start looking? I kept wanting to pick a tomato off and eat it but I knew I would burn myself!! But it was worth the wait for the finished dish. This really is an amazing dish. 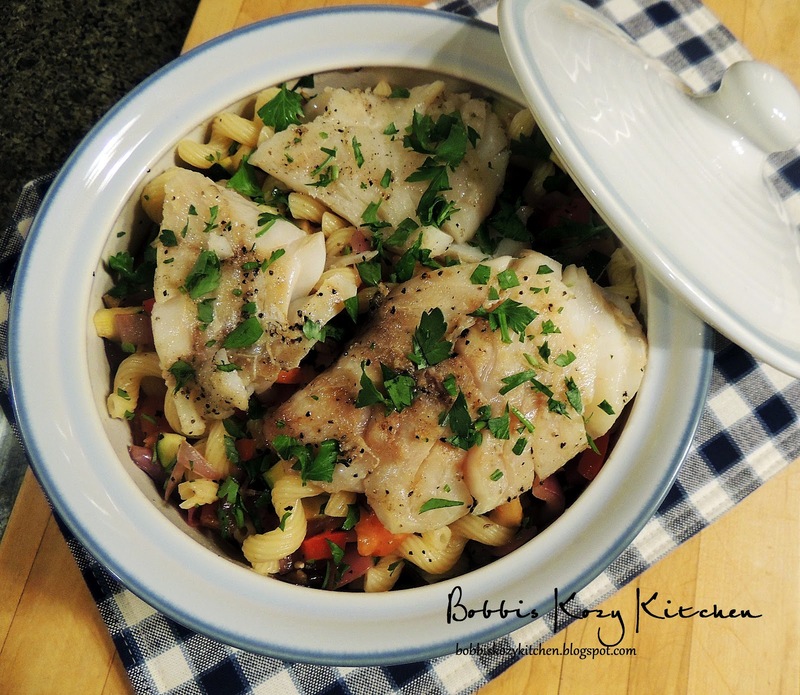 The fish, the veggies, the pasta? Mmmmm heaven!! Bring a medium pot of water to boil, salt well and add the pasta, cook according to package instructions. Drain and return the pasta to the pot. Heat a grill pan to medium-high heat. 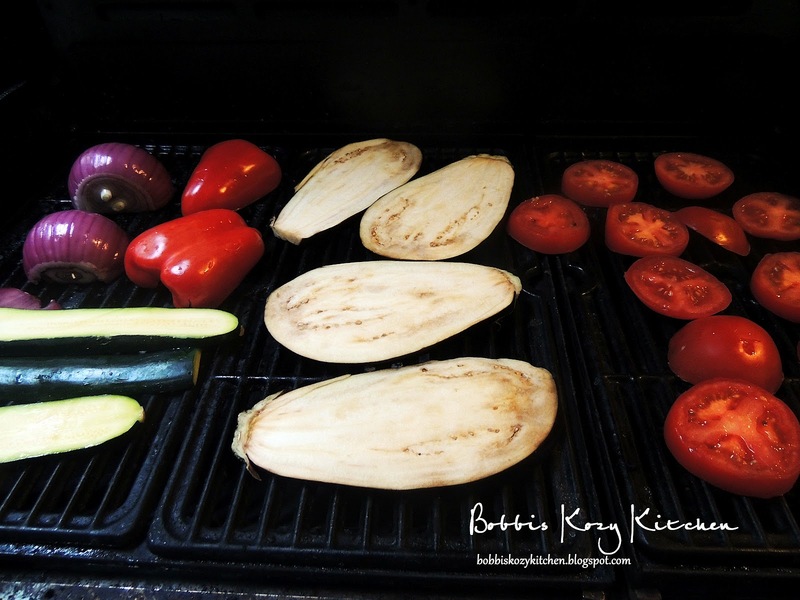 Lightly oil the hot grill and place the vegetables on the grill. You may have to work in batches. Brush the veggies with oil and salt and pepper them. Cook on each side until browned and tender. Transfer to a cutting board to cool. Rough chop the veggies and add them to your cooked pasta along with the oil and vinegar. Season with salt and pepper and the parsley and toss. Season both sides of the fish with salt and pepper and place the fillets on a clean oiled grill. Allow to grill without moving until the fish becomes opaque about half way through. Carefully turn fish and finish cooking. 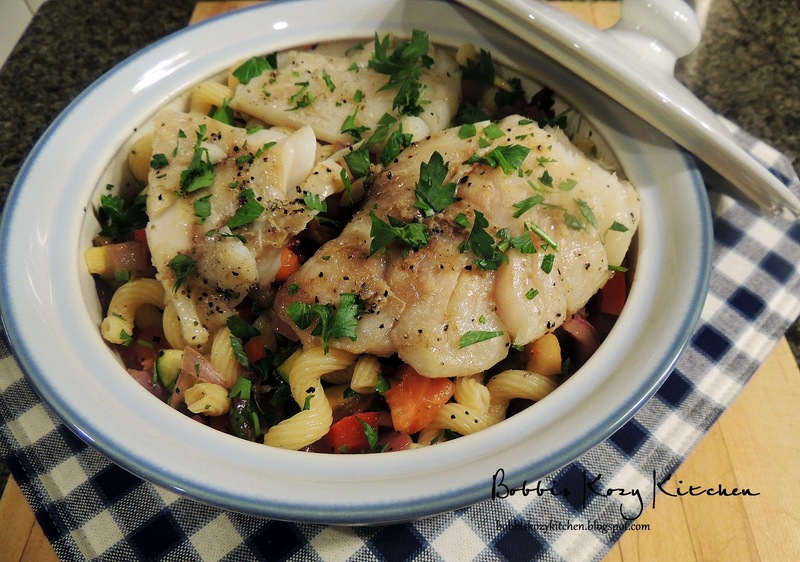 To serve place a heaping pile of the pasta in a bowl and top with a fish fillet, sprinkle with parsley.